The 16-year-old has mobilised thousands of students across Europe. Sweden's teenage activist Greta Thunberg on Tuesday urged Europeans to vote in next month's elections on behalf of young people like her who cannot yet cast ballots but demand decisive action against climate change. 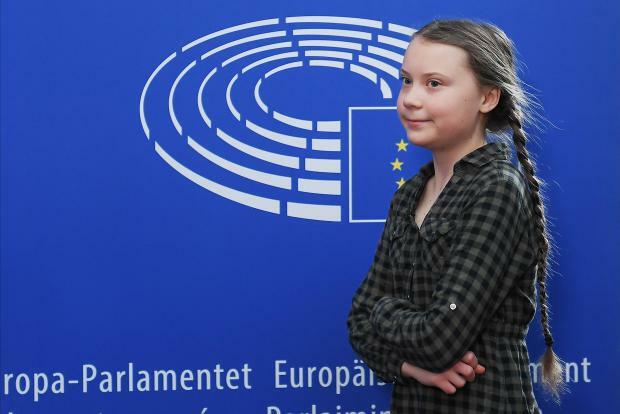 During a visit to the European Parliament in the French city of Strasbourg, Thunberg, 16, told a press conference that time is running out to stop the ravages of global warming. "I think it is essential to vote in the European Union election," Thunberg said when asked about the May 23-26 elections for a new European Parliament. "I'm not going to vote in the European election because I can't," she said, because she is too young to vote in Sweden. "Therefore it's especially important for those who actually can vote to give us that in order to speak on behalf of people like me who are going to be affected very much by this crisis," Thunberg said in fluent but halting English. Following a meeting with European Parliament President Antonio Tajani, Thunberg urged voters to use the opportunity to "influence the decisions" on climate taken by elected and appointed officials. "We still have an open window that is not going be open for long in which we can act," she said. "So we need to take that opportunity to do something and they (politicians) should do something." During a visit to Brussels in February, Thunberg urged the EU to double its ambition for greenhouse gas cuts, upping its target from 40 per cent to 80 per cent by 2030. Under the 2015 Paris deal to limit global warming to well below 2 degrees Celsius, the 28-nation EU has pledged to cut greenhouse gas emissions by at least 40 per cent by 2030, compared to 1990. EU officials are now talking of increasing the figure to 45 per cent. The UN's Intergovernmental Panel for Climate Change (IPCC) has said warming is on track toward an unliveable 3°C or 4°C rise, and avoiding global chaos will require a major transformation. Thunberg, who is due to speak to a parliamentary committee in the afternoon, has inspired tens of thousands of children worldwide to boycott classes to draw attention to climate change. A demonstration calling attention to climate change is due to take place later Tuesday in Strasbourg before the parliament.